FORT RUCKER, ALA. - Each year, numerous people are injured and killed from dangers lurking in the places they least expect - at home and at work. The culprit is slips, trips and falls. According to the National Safety Council, falls are the leading cause of unintentional injury in the United States, accounting for more than 8.6 million visits to emergency rooms annually. 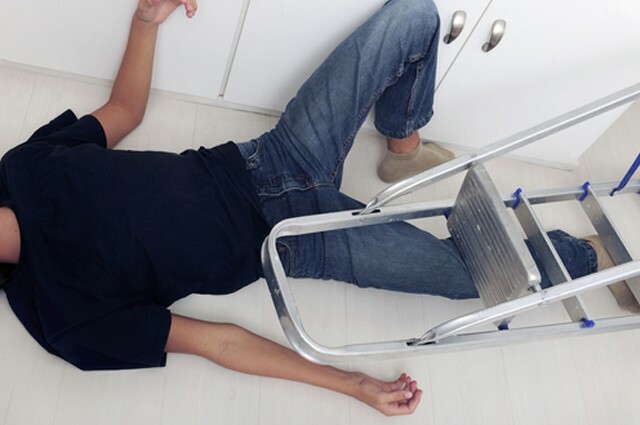 In 2009, 16,900 Americans died from fall-related injuries in their homes. "By taking some time and looking around the house, both inside and out, individuals can greatly reduce their chances of having an accident associated with slips, trips and falls," said Al Brown, safety and occupational health specialist, U.S. Army Combat Readiness/Safety Center. "Folks need to be aware of the hazards in and around their homes. Seemingly harmless household items, landscaping, toys, etc., could result in an unexpected visit to the doctor's office. "Most people trip over items left on the floor because of poor housekeeping, curled edges on carpeting, open drawers and cabinets, area rugs with no rubber backing, and cords. It's important to always maintain a clear path ahead when walking," Brown said. "Unsecured flooring, lack of railings or supports around stairs and bathrooms, lack of support in slippery areas such as the bathroom or bathtub are also hazards that are easy to fix." While the NSC reports that adults 55 and older are more susceptible to falls, no one is immune to these accidents. Brown said children often fall while they are outside playing. "Simply watching your children while they play can be the No. 1 way to prevent falls," Brown said. "Rocks, grass, gravel, cement, brick and stone are all highly inappropriate playground surface covers. None of these surfaces helps protect a child's skin or limbs if they fall. Rubber mulch and padding are better ground cover alternatives. "Outdoors, common trip hazards include steps with uneven risers or gaping cracks and different levels in the surface of concrete walkways, patios, etc.," he added. "Folks should maintain areas around their homes by removing debris and other environmental hazards and by replacing low or inadequate lighting." The potential for slips, trips and falls around the house are avoidable if individuals take the time to identify and fix hazards. The same goes for the workplace -- Soldiers, Civilians, supervisors and subordinates alike should be cognizant of their surroundings and take ownership of their personal safety. In fiscal 2011, slips, trips and falls suffered by Department of the Army Civilians cost the Army nearly $48 million. From fiscal 2006 through 2011, there were seven reported class A slips, trips and falls involving Soldiers; of those accidents, three resulted in fatal injuries. Brown said good housekeeping is just as critical at work as at home. "If your organization's housekeeping habits are poor, the result may be higher incident and accident rates," he said. "If an organization's facilities are noticeably clean and well-organized, it's a good indication that its safety program is effective as well."